Electric Vehicle Supply Equipment, or EVSE, supplies energy to fuel the operation of all-electric and hybrid vehicles. If you own or are thinking about purchasing an electric vehicle, you may be interested in the added convenience of a home or business charging station. What is an electric vehicle charging Station? Similar to a traditional gas pump, an electric vehicle charging is a single unit with a cord which links to the vehicle outlet. A full-charge takes much longer than fueling a traditional gas operated vehicle, so adding your own electric vehicle charger gives you the luxury of charging at your convenience. 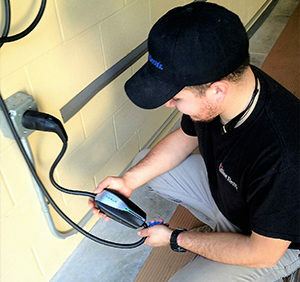 What does electric vehicle charger installation consist of? If you’re planning on adding a charging station to an older home or building, you may need a full electrical upgrade, including a new Electric Service Panel and outlets capable of handling the extra power demand. Your electric vehicle may come with a package including personal charging station equipment. However if it does not, you will need to select the charging station or install a new NEMA 14-50 outlet. Installation with Brilliant Electric of the East Bay includes help with choosing the right charger for your home or business, a full inspection of equipment and installation site before and after installation, a full electrical system upgrade, a full overview of your equipment information, and more! I’m thinking about becoming an electric vehicle owner, what should I know? An electric vehicle can reduce your carbon footprint while also lowering your transportation costs. Electric vehicles can be short range and have a substantial charging time, but installing your own home or business charger will give you the convenience and peace of mind you’re looking for! Electric vehicles also come with the benefit of tax incentives. The federal government offers an incentive of up to $7,500 for new electric vehicle owners as well as several deductions for your electric vehicle charging station installation.